Targeting is a Crafter CMS feature that allows delivering the right experience, with the right content, to the right people at the right time. 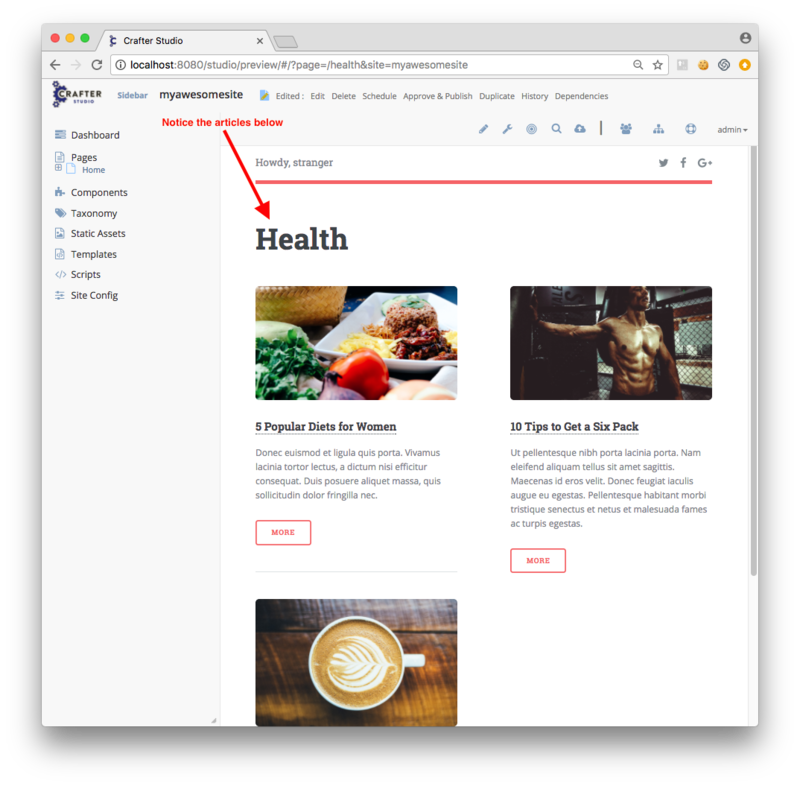 Crafter CMS provides the ability to render content adapted to specific users, depending on different aspects like geographical location, language, preferences, etc. 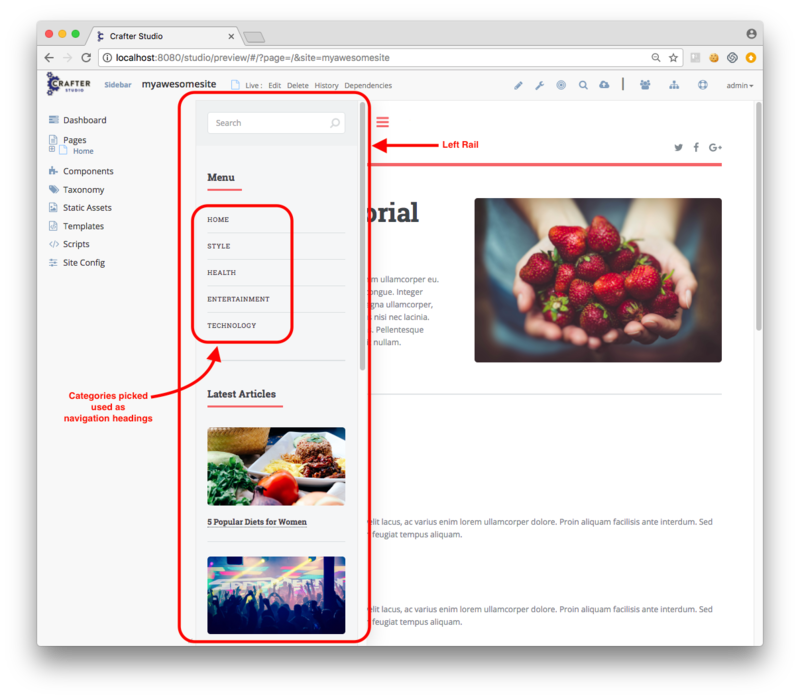 The following sections describe how you can use this feature to organize content. 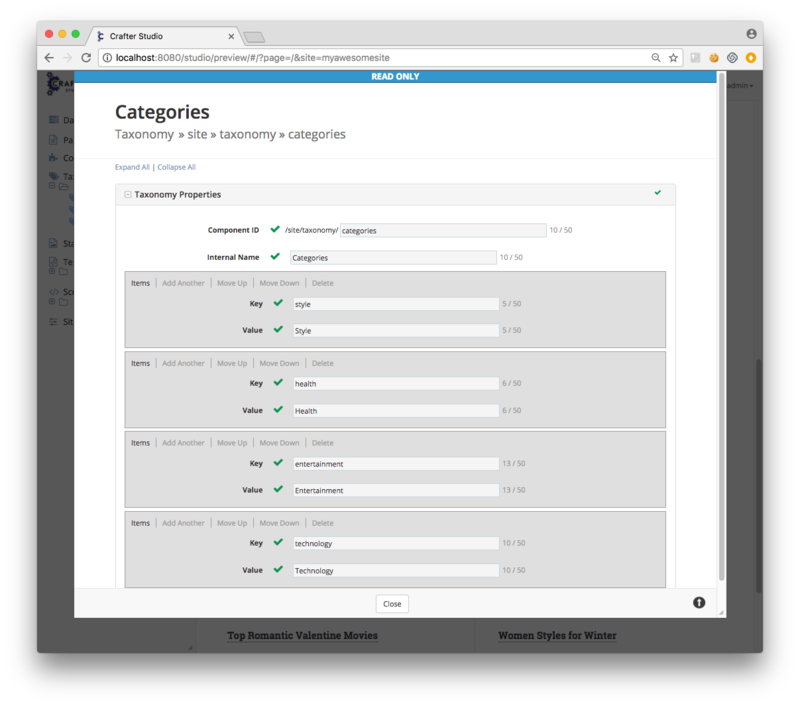 Taxonomies allow you to organize your content to make it easy for your site users to browse what they want and deliver content appropriate for them. It also allows you to search for content faster. 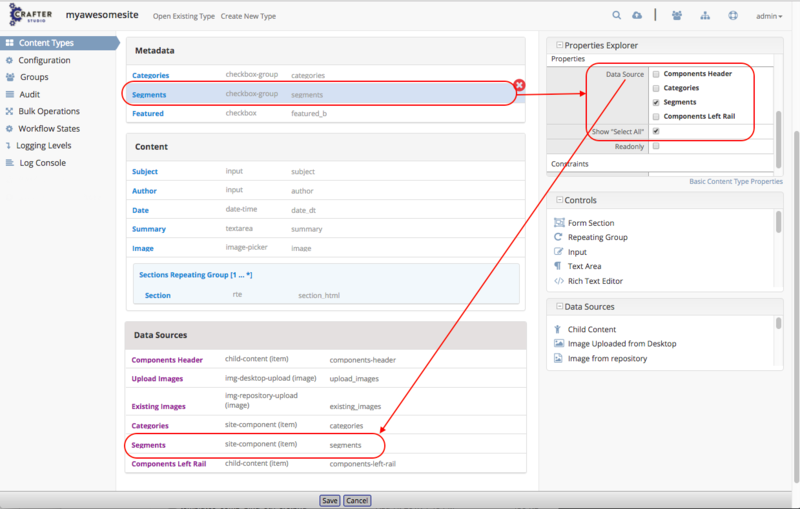 The Content Authors - Targeting section of the documentation, describes how Content Authors can target content with taxonomies based on segments and how to view the site depending on who is browsing. 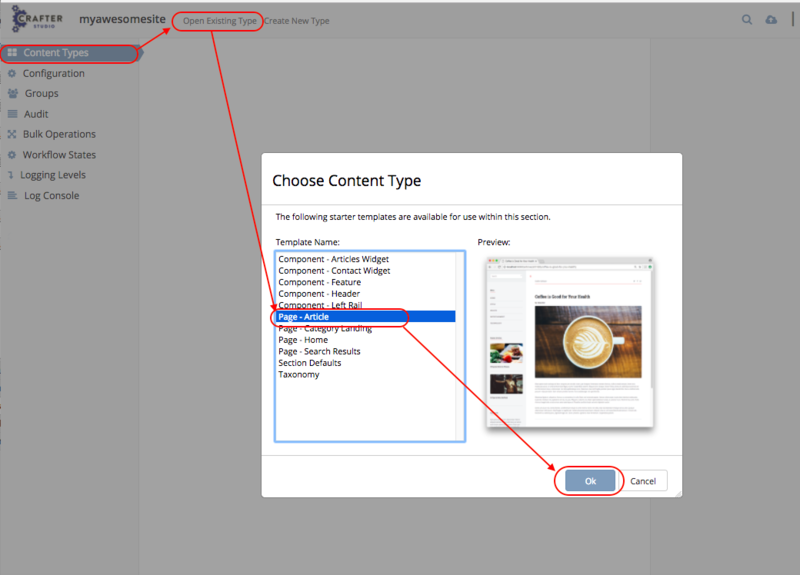 This section describes how to add the segments and segment targeting on pages as seen in the Website Editorial blueprint, so that content authors can target their content. For the segments, we will have the values Guy and Gal. 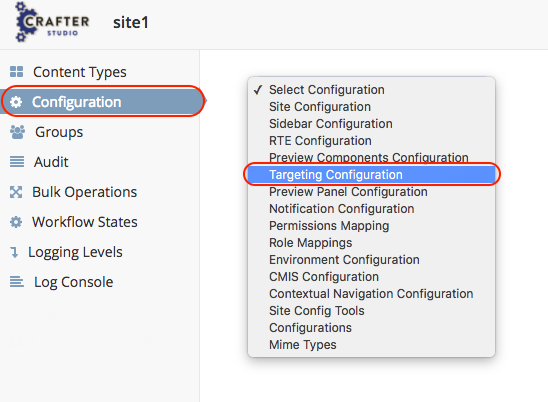 Targeting can be configured by clicking on in the Sidebar, then clicking on Configuration and finally selecting Targeting Configuration from the dropdown box. Below is the sample configuration for Guy and Gal, that is used in the Website Editorial blueprint. Here’s the list that will be used by the Website Editorial blueprint when modeling the segments into the content. The list was created by right clicking on Taxonomy in the Sidebar, then clicking on New Content. 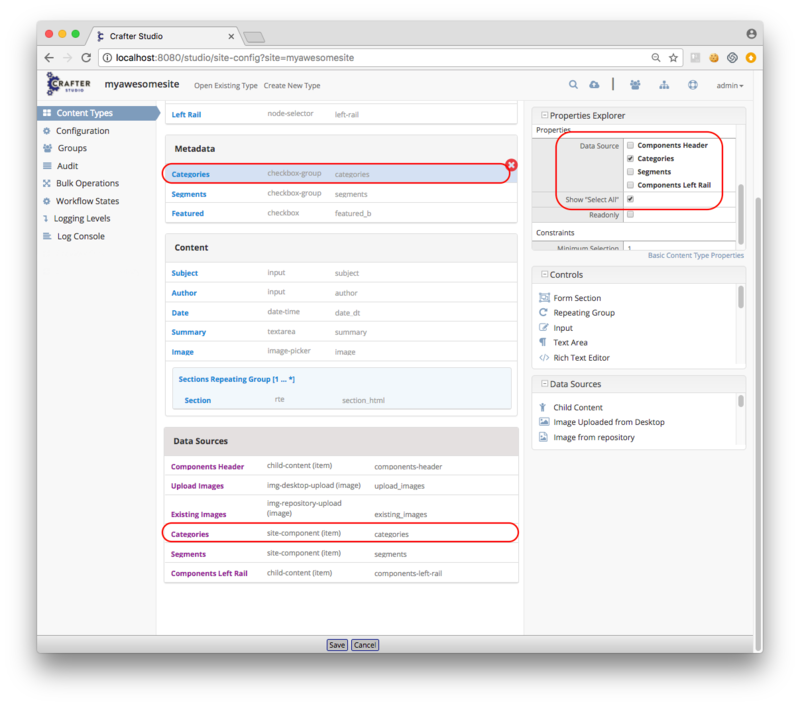 In the Metadata section of the form, a Grouped Checkboxes control is used to model our segments. 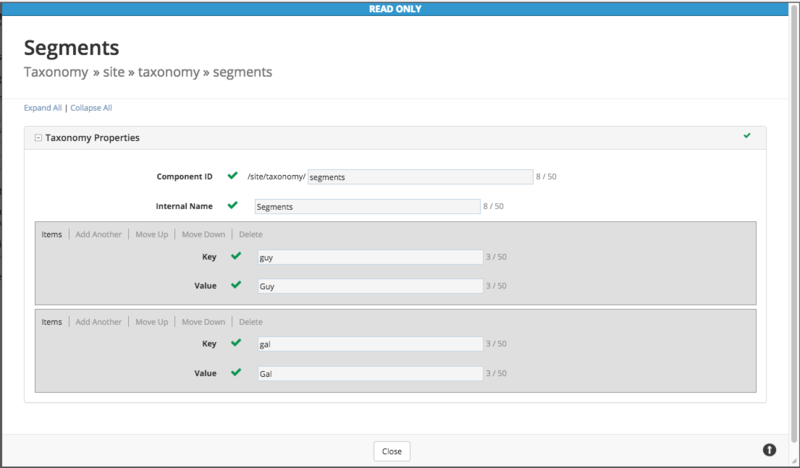 The control is then named Segments, with the Data Source property in the Properties Explorer Section set to Segments. Now that we have modeled the criteria, we can now update the content. 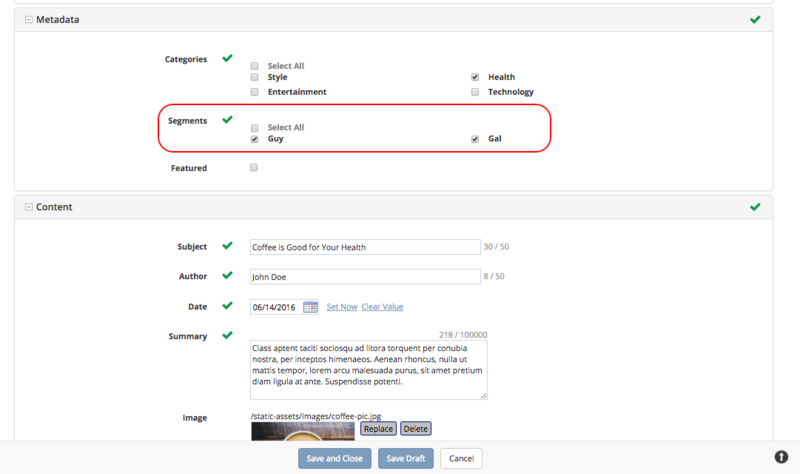 When you create a new article page, you will see the grouped check boxes that we added in the previous section, in the Metadata section, ready for the content author to select which segment the page is targeted for. 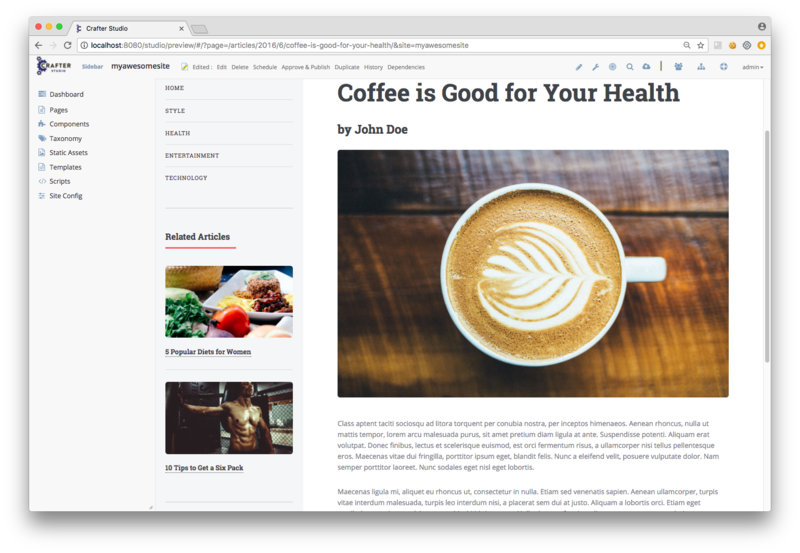 We will look at one of the articles in the blueprint, “Coffee is good for your health” as an example of content for targeting. Click on the article from the Sidebar, then click on Edit in the context nav. Notice that the article is targeted for both Guy and Gal (Guy and Gal checkbox checked). Here’s the list that will be used by the Website Editorial blueprint when modeling the categories into the content. The list was created by right clicking on Taxonomy in the Sidebar, then clicking on New Content. In the Metadata section of the form, a Grouped Checkboxes control is used to model our categories. 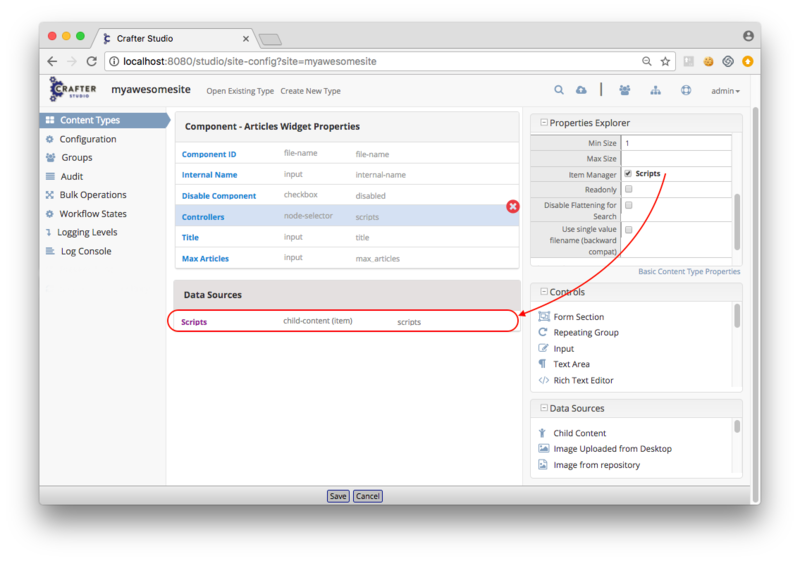 The control is then named Categories, with the Data Source property in the Properties Explorer Section set to categories. Now that we have modeled the criteria, we can now target content. 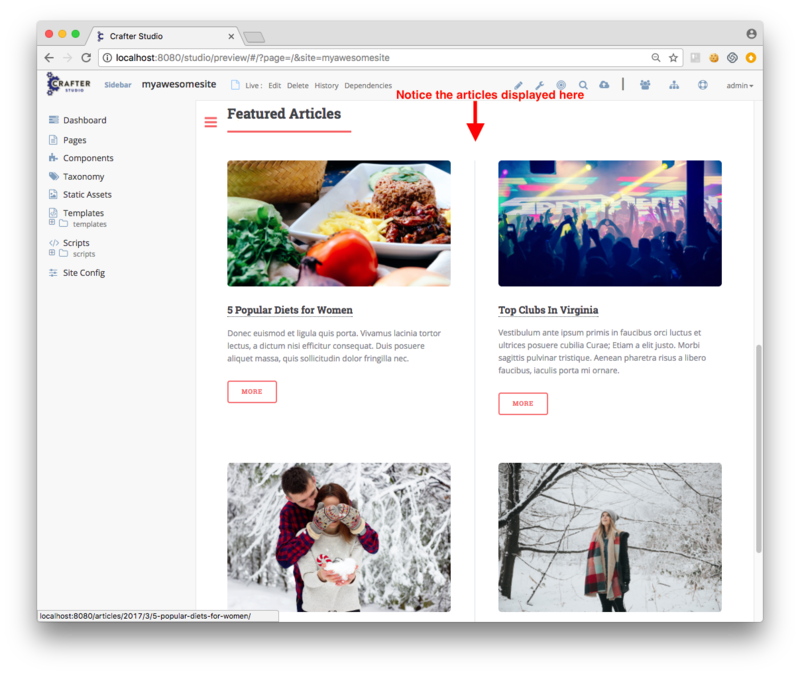 When you create a new article page, you will see the grouped check boxes that we added in the previous section, in the Metadata section, ready for the content author to select which category the page falls into. 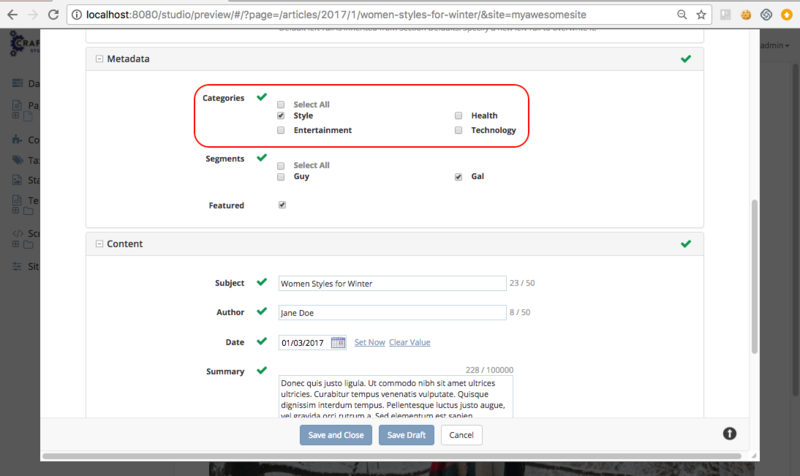 We will look at one of the articles in the blueprint, “Women Styles for Winter” as an example of targeting content based on category. Click on the article from the Sidebar, then click on Edit in the context nav. Notice that the article is targeted for the Style category. After updating the content, we can now see how we can use the categories we just setup on displaying content. Let’s take a look at the homepage of our site. On the left side of the page, you can see the left rail of our site. If your screen is not wide enough, look at the top left corner of the page, there is a hamburger icon/button (multiple lines in red that sort of looks like a hamburger), click on that icon to display the left rail. Let us look at the navigation menu on the left rail. As you can see, the categories we used to target our pages can be used as navigation headings for the site. In order to display just the articles targeted for a certain category, a groovy script is run before the page renders. To do this, we need to create a script named after the page we want the script to run before rendering, under scripts -> pages In the groovy script below, a query is sent to ask for all articles targeted for the requested category. (To see the script in Studio, from the Sidebar. 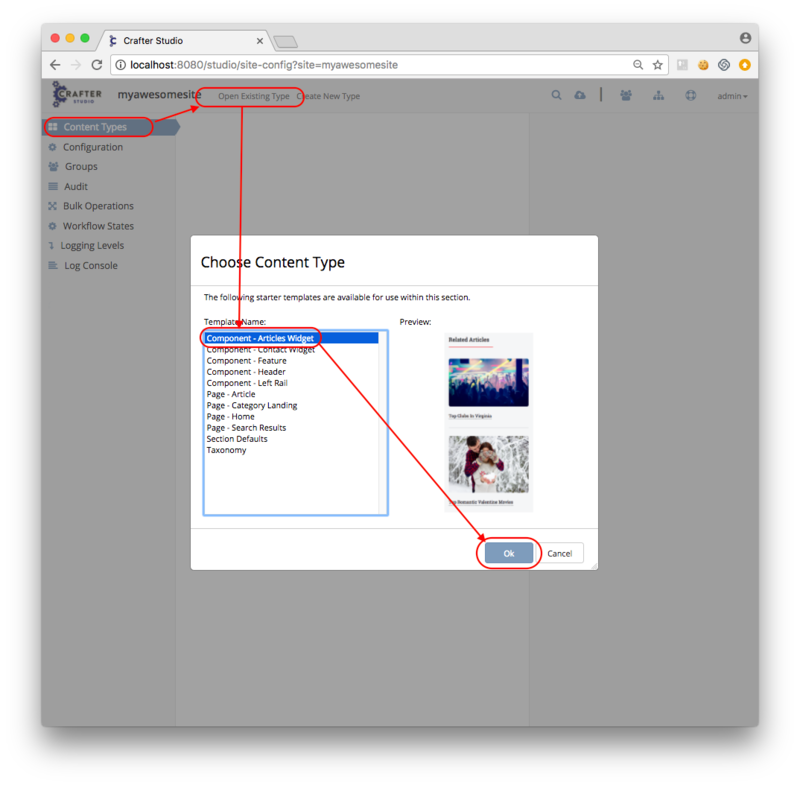 navigate to scripts -> pages -> category-landing.groovy) Please see Content Type Controller Definition for more details on binding a script to a page or component. In the dialog, notice the item selector control labeled Controllers with data source Scripts. This picker will be used to select which script we want to run before the component renders in its container. In the Controllers section, you’ll see the groovy script that will be run before rendering the component. 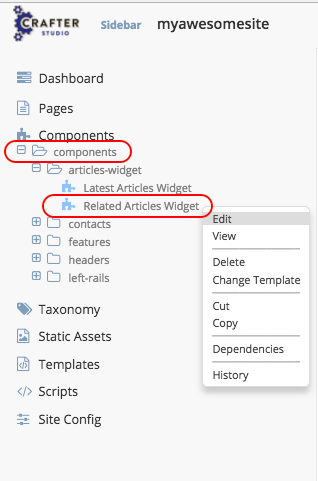 To open the groovy script, click on the Sidebar and navigate the tree to scripts -> components then right click on related-articles.groovy and select Edit. 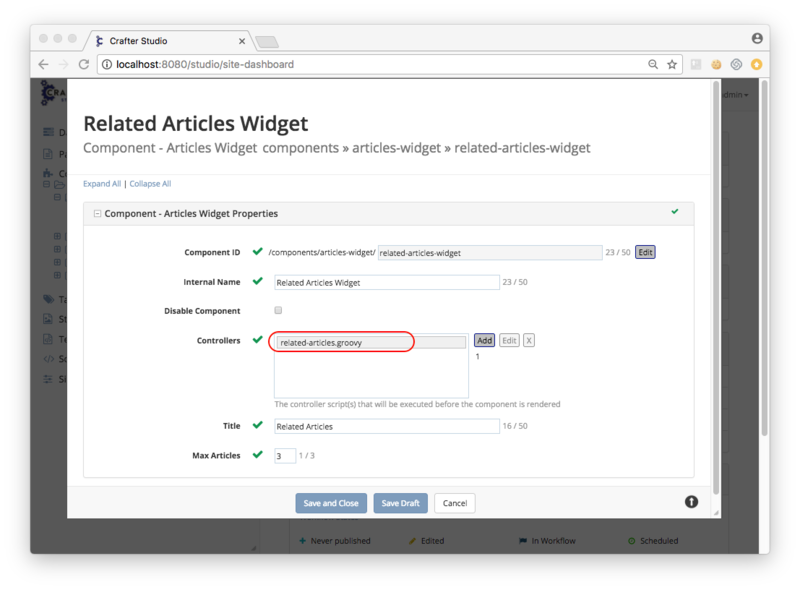 In the groovy script, it sends a query for articles in the same category as the article being viewed, then passes on the articles to the template model of the component ready for rendering. To see the component in action, click on one of the articles to view. In the image below, the article Coffee is Good for Your Health is being viewed, which is tagged for the Health category, then the left rail is expanded by clicking on the hamburger icon at the top left of the page. In the left rail, we can see the related articles to the one currently being viewed in the page (articles tagged for category Health).